7778 Midi-scale Millennium Falcon is a Star Wars 10th Anniversary Line set released in 2009. It was exclusive to Wal-mart in the United States and a Tesco exclusive in the UK. 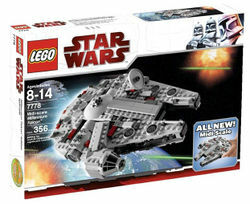 At "midi-scale," the Falcon is too small to support minifigures, yet large enough to sport high detail and advanced building techniques. It is composed primarily of layered plates rather than bricks and features few moving elements, being intended for display as much as for play. Rotating guns on the top and bottom and a spinning radar dish are the sole moving parts. The six grilles towards the rear of the ship and the four patches of machinery towards the front are printed 2x2 round tiles; however, the cockpit is marked by a sticker. The Millennium Falcon was a cargo freighter which Han Solo won off Lando Calrissian in a game and made many adjustments and improvements to. It is the main 'hub' for the characters during the Original Trilogy, as it features in all three of the films and is a primary setting. It is armed with a turbolaser cannon on both of the top and the bottom of the ship. It can travel at 1.4 times light speed. Although the set is part of the 10th Anniversary Line, the box uses the The Clone Wars style. The set was priced at £29.99 in the United Kingdom but was later raised to £34.99. This is a description taken from LEGO.com. Please do not modify it. The most famous ship in the Star Wars™ galaxy – at an all-new scale! It’s the Millennium Falcon as you’ve never seen it before! Han Solo’s famous starship returns as a special-edition mid-scale model. Movie-authentic details include a rotating radar dish and movable laser cannons above and below! A must-have special edition midi-scale Millennium Falcon! Dimensions: Length = 9.3 inches (23.5cm), Width = 6.7 inches (17cm), Height = 3.2 inches (8cm)! Facts about "7778 Midi-scale Millennium Falcon"
The most famous ship in the Star Wars™ galaxy – at an all-new scale! This page was last edited on 9 January 2016, at 21:55.